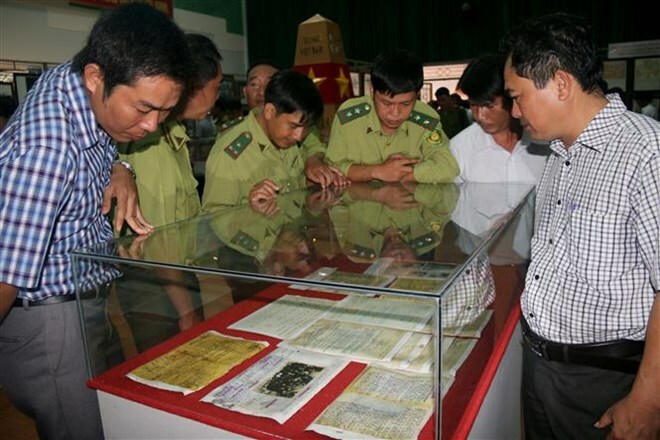 Binh Thuan (VNA) – An exhibition of maps and materials, entitled “Hoang Sa, Truong Sa of Vietnam – Historic and legal evidence”, opened in the central province of Binh Thuan on August 7. On display are nearly 100 maps and atlases selected from more than 260 ones featuring Vietnam’s sovereignty over Hoang Sa (Paracel) and Truong Sa (Spratly) archipelagoes, documents written in ancient Chinese, Vietnamese and French languages and issued by the Vietnamese feudal states and French administration in Indochina from the 17th – 20th century. There are the Nguyen dynasty’s royal records and administrative documents from 1954-1975 and from 1975 to now, which affirm Vietnam’s exercise and protection of its sovereignty over these islands. The exhibition also showcases publications and studies by domestic and foreign scholars, including the atlas Universel compiled by Belgian geographer Philippe Vandermaelen in 1827.